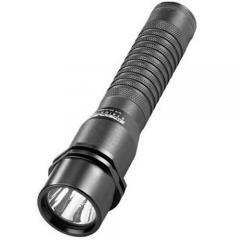 The Streamlight Strion LED is a compact rechargeable flashlight designed for professional use. Made from machined aircraft aluminum with a durable anodized finish, it is impact-resistant to two meters and also features IPX4 water resistance. The convenient push-button tail switch toggles between three power settings and a strobe mode for signalling to allies or disorienting opponents, and at maximum power the flashlight puts out 260 lumens with a range of 200 meters. The optimized electronics keep intensity consistent as the battery drains, and it can be fully recharged in just three hours to provide up to 7.5 hours of run time. It features a clamp-style charger that includes an LED charge indicator. Great light I lost my first one and could not get another one fast enough. This little light packs a lot of beam for it's size. I've needed to use it for 20-45 minutes many times between charges and it didn't go dim yet. I tried most other less expensive imitations and they never performed like this. Very bright, nice and compact. 2nd one in 5 years, I prefer the beam on my first one that was more concentrated with less of a halo, overall a great light. Great light, brighter than expected. Great flashlight. Great for work the on/off button on the back makes it perfect for the type of work I do. Bought this item as a gift and he has nothing but great things to say thanks. Awesome flashlight, lightweight and durable. Does this flashlight come with an ACDC charger? Only if you select the "ACDC" option.